Asphalt Green developed the Recess Enhancement Program (REP) in 2001 to address barriers to physical activity by reclaiming an underutilized part of the school day—recess! Our highly trained and talented Play Coaches get children physically active through organized games that decrease conflict and increase self-esteem, safety and fun. Through our Recess Enhancement Program, we are serving more than 47,000 students (kindergarten through fifth grade) from 105 elementary schools in Manhattan, Brooklyn, Queens and the Bronx. We focus on offering REP in New York City schools where a majority of students receive free or reduced meals in neighborhoods with low physical activity levels. Experts recommend that children should be physically active 60 minutes a day with 30 of those minutes occurring during school hours. However, only 50-percent of children ages 6 to 11 meet that recommendation and approximately 40-percent of US schools have either eliminated or reduced recess since 2001. Plus, schools in urban areas with a high minority population and poverty rates are far less likely to get daily active recess. Even with these current health disparities and challenges, our Recess Enhancement Program significantly increases physical activity for children. A recent study showed that schools with Asphalt Green Play Coaches increased students’ vigorous physical activity rate by 52 percent when compared to schools without them! The benefits of our Recess Enhancement Program go beyond the playground. Through the power of play, we help children develop physically, socially and emotionally. Research has shown that children who are more physically active perform better academically in school. Through REP, students are given the opportunity to be physically active and create the foundation so they can be healthy and fit for a lifetime. 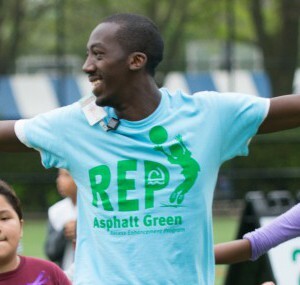 Learn the basics of REP and how it helps NYC kids be active. 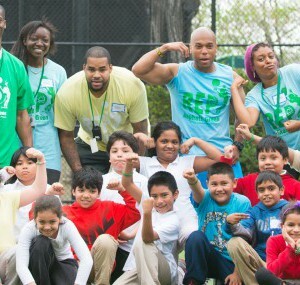 Learn how REP is improving the health of NYC kids. Learn how to bring REP to your school.